I just did a new Facebook Live with Brett “The Fury” Curry of OMG Commerce. We talk about YouTube and Google — and give you a big easy WIN to leverage in your YouTube ads. Google and YouTube are severely under-utilized by online business owners. Google dominates search, accounting for 67% of all online searches. Though when Brett looks at the data — and he’s looked at thousands of Google Analytics accounts — he says that figure is closer to 80-90% in our industry. Not only that, but Google’s Display Network covers 97% of the internet! The opportunity this gives us as online sellers is pretty incredible. So how do we take advantage of it? Brett has been helping BOOM! leverage this powerful visibility source in many ways, especially later in our sales funnel. Which brings me to that big easy WIN I mentioned. But the cool part is this: the ad also has a product carousel, a product overlay and a call to action overlay — in the video! These ads are bringing in $5 and $6 sales — a great number for us at this stage in the funnel. And by taking advantage of this new visibility source, we’re reaching prospects who would’ve otherwise fallen through the cracks. Watch the video to check out how we’re doing this for BOOM!, then stick around for a Q&A on YouTube, Google Shopping, Google Search and more. Ezra: Smart Marketer live ladies and gentlemen with Brett the Fury Curry. What’s up, man? Ezra: How are you doing? That was, like, real. That was intense. That was two dudes just shaking hands. Brett: That was real. That was legit. Ezra: Let’s make sure we’re actually live on the Facebook fan page here. I’m here with Brett Curry of OMG Commerce. Is that meant to be Oh My God Commerce? What are we talking about here? Ezra: Online Marketing Giant. You’re a giant amongst some of the marketers. Brett: We wanna make our customers giants online that was the whole idea behind. Brett: That says what people run with me, OMG. Everyone calls it OMG. Ezra: So Brett Curry, what are you doing at my house, first of all, and what’s this…? Ezra: How do we even know each other? Let’s just go way back. Brett: Damn. We met at Traffic and Conversion Summit. Ezra: Okay, and shout out to Digital Marketer, shout out to Run and Dice. San Francisco? Ezra: And let’s cut back to the main camera, so always just keep it on this camera. So, I ran into you in the elevator in a wife beater? Brett: Yeah, you were going to work out, yeah. Ezra: Which by the way, actually real quick, I think that the term wife beater to describe that garment. Ezra: Meaning, growing up as a kid that what was it described as. In the lingo of where I grew up, people described it that way. No one ever thought and said anything about it. I was a kid. I just adopted this terminology same what you did as a person who adopts lingo from, you know, your culture or whatever. Brett: What a horrible name for a shirt. Ezra: As I got older and started to, like…I was like, “Wait a minute, why is it called this?” And I looked into it and I realized actually a lot of people are…there’s a movement to remove that as a way of describing a tank top, yeah. Ezra: You were one of the first members of the board. You might been the first member of Blue Ribbon. Thank you for that. Brett: You’re welcome, man. I’m honored. Ezra: I just wanted to shake your hand again just to get that in there. Blue Ribbon, which is now the premier…which now has a 80 plus mastermind for e-commerce. Ezra: That’s got to be four or five years ago. Brett: Yeah, it’s been a long time. I don’t know what year it was, a long time. Ezra: So this presentation in addition to us just hanging out, we were actually at my house. This is my basement here. Ezra: Thanks, man. Yeah, there’s good energy in this room. Ezra: We got Aunt Cheesy [SP] on the TechStacks, we got Ruben St. John upstairs write and copy, and doing other things. But anyways, we’re here to produce some content around YouTube ads and how we’re leveraging YouTube and Google, and shopping We’re gonna talk a little bit about that. So, before we get into talking kind of about business strategy, what has been the trajectory of your business since becoming like…because you were a search engine optimization guy. Brett: Yeah, SEO guy from about 2004 is when I did my first SEO campaign. Fell in love with it. Got a company ranked page one for the search brochures. The e-commerce company back in 2004, top-level search. Ezra: And back then, just if you don’t know, you know, that was the skill set that you needed to be an online marketer, really. Brett: Totally, that was the game, man. Ezra: That of searching optimization, right? Brett: So then the guy introduced me to Google Shopping, Todd Kraine [SP] a mutual friend of ours. Ezra: Yeah. Oh, Todd Krainy. He is also an original Blue Ribbon member. Brett: …he talked about Google Shopping I was like, “This is the real deal.” So I dove in really learned how to master Google Shopping. Wrote the ultimate guide to go to shopping, that Shopify published, which has been really good for our business and that kind of launched it. So really kind of going from just SEO to more paid search. Ezra: And by the way, I’m just popping here in the computer to make sure the Facebook Live is up. But why put a focus on Google Shopping as a visibility source? Like most people of that time were focusing on Facebook, you know? Brett: It was working. And so, I mean, I heard of these amazing returns like 10x turns. So that was a little harder than it was back in the day. But just consistent returns, usually, when someone’s clicking onto shopping ad they’re pretty likely to purchase or either a very serious shopper whether a buyer right then. And so it’s just great channel to build your business. Ezra: Awesome. And so you kind of, I’m hearing now, I’m just verifying that we are indeed live on the Facebook page. So if you wanna chat with Brett, you wanna ask questions, you wanna talk about what we’re talking about. You wanna, you know, throw in links, so we could look at your website. I mean, I will be monitoring these comments on my mobile phone because they’re more in a…you know, they’re coming up in real time. But let’s talk a little bit about quickly, you built, like, the choice of the business model. Most people’s business models who are watching this are probably e-commerce business owners. Now your business model’s a little bit different and that, like, you are an agency serving other clients. So why go that route as a business owner? Like, why did that seem suitable to you? Brett: I’ve always loved marketing, and I’ve always loved kind of the science what makes people respond to good ads, and how to move, and influence consumer behavior. And then, I don’t know, just knowing about personality. I’m suitable well for the service based business. I like helping people reach their goals, and their objectives, and so coming alongside of business, and taking a great product, great brand, adding good marketing to it, just seemed to fit. And so I had fun with it. Ezra: And now you have one of the more prominent services agencies in our industry that deals with Google. Which can be… Like, by the way, a lot of people don’t know this, we’re like new to the industry. People know Facebook. They know Instagram. They even know, you know, even Pinterest to some degree. But people don’t really realize how powerful of a visibility source Google can be for their business. So, will you, in your fancy Google person way, by the way, Brett just came back…yes, you are a fancy Google person. Brett: Thank you. Thank you. Ezra: …came back from Google Headquarters in New York City. Ezra: Rattle off a few statistics about Google’s, you know, visibility. Brett: Yeah. And so, no surprise Google dominates search. And so I think the official numbers, you know, from comScore, or whatever, it’s like 67% of search. Google owns that percentage. But if you dig into Google Analytics accounts, we look at, you know, hundreds of Google Analytics accounts. Often it’s closer to the 80% or 90% of the search traffic comes from Google. And usually, if you look across e-commerce companies, often the driving traffic source period is Google organic and Google search, especially if looking at the companies. But then if you look at Google Display Network, 97% of the web is covered by the Google display networks. Ezra: So let’s talk a little bit about what that means. So basically, when we first got into the game, if you wanted to make money on the internet, if that was your agenda, if that was your goal that you were going for, one of the ways that you did that back then was you put together a content blog. So a blog like a website that was about a specific subject matter that had a lot of content on it, and so you’d get people to come to read that content, and then the way that you would monetize the website is how? Brett: So, through Google Adsense. So, you allow Google place ads on your blog. They do a little revenue share with you. You make money, they make money, and then, you know, advertisers have an audience as well. Brett: Ninty seven percent of the web. Brett: Which is crazy. So I saw the stat at the end of last year, $2.9 billion in growth with digital advertising, 99% of that growth came from Google and Facebook. So almost all the digital ad growth is coming from Google and Facebook. Ezra: Meaning people spending money on it? Brett: Exactly. So advertisers spending money on digital marketing really all of that display money is going to Google and Facebook. Brett: Slightly over half go to Google, slightly under half going to Facebook. Ezra: So Google still has more market share than Facebook when you look at ads, people buying ads. That’s because Google has YouTube. They have Google Display Network. They have Google Shopping. They have Search. You know, that’s four products as opposed to Facebook just has now Facebook when people are on it. Now they have Instagram, and then now they’ve got the audience. Brett: I think there was [inaudible 00:09:20] Google partner. Some of them like 7 properties now at over 1 billion users that Google has. When you have like Gmail and Playstore. Ezra: I forgot about Gmail. So we’re getting in the bunch heart. It’s a little bit of…you know, we’re getting to hold…people are clicking the like button. Ezra: Somebody is clicking, somebody must really like you, Brett. Because somebody is clicking a lot of these hearts right now. Brett: Somebody is silly. Somebody is being silly. My wife’s not on here. I don’t know if it’s for long. Ezra: I have never even seen that amount of hearts on anyone on my post. So it must be you. You know, I mean, Brett Curry, coming to us. Brett Curry was wearing a pink shirt. Brett: Yeah, I was rocking the pink. Ezra: It was a good shirt. But it clashed with the gray so we went blue and gray. Brett: It was very loud and obnoxious. Ezra: I wouldn’t call it obnoxious. I would just call it perhaps clash with the background. Brett: Distracting. You’re being kind [inaudible 00:10:10]. Ezra: Dude, who is putting all these hearts in here? I’ve never seen anything like this. This is kind of amazing. Brett: It must be Chris Brewer he’s messing with us. Ezra: Yeah, it’s like Chris Brewer on there. So let’s talk a little bit about, like, if you have an e-commerce brand, and you wanna leverage Google, you wanna leverage YouTube, you wanna leverage the power that is this visibility source for a business that most people don’t recognize, you know who recognizes it real quick? You don’t recognize the power of Google more so than anyone? What sub-community business owners is local businesses. Brett: You know what’s interesting we talked about this at Google yesterday was that people were typing in things like, “Breakfast near me.” The percentage of those searches is actually decreasing. Where people are now just leaving off near me because Google knows anyway. They know Google where you are. So you just type in, “Breakfast.” And so, got these results, I was looking at reviews, and I ended up just going to Starbucks because I had to rush. Ezra: So my point was that…would you like to Instagram…tell us in an Instagram verbal story about the breakfast that you…did you take any snap pictures and put it on Instagram? Brett: No, dude. I was in a hurry. Actually, it was cold. There a fail, it was a Starbucks fail. Ezra: You didn’t get any food at Starbucks? Starbucks is where you went for breakfast? I would say Google gave you a bad suggestion. Brett: Well, no. They gave me…I saw a place that had bad reviews. I looked at a few that…I was in a hurry. I had to get on a call, and catch a train, and come see you. So I just rushed. Ezra: That was this morning. Brett: It was this morning. Ezra: Poor guy hasn’t had breakfast yet. You didn’t even eat when you got here? Brett: That’s why I was snacking on all those chocolates up there dude. Brett: Peel back the curtain on that Boom AdWords account. Ezra: Kind of show you how we’re using YouTube. You know, if you’re engaging with this video you’re probably a Smart Marketer subscriber so you know that we have courses. We’ll be doing a course at a later date. If you’re interested in that you can private message me and say, “Hey, I wanna pre-purchase that at a discount or whatever.” You can send me a private Facebook message. So talking about that, one of the ways that we’ve seen every e-commerce brand be able to win using Google is to use it not in the part of the funnel one most people are using Facebook. So can you talk a little bit about how kind of…and we’ll show one of the examples of this, but how kind of we figured out a way for you to implement this and pretty much guarantee a win? Ezra: And most people who are…just to interrupt you for a second, most business owners are using Facebook as their main source of visibility into their brand, right? Like, they’re driving people from Facebook. Brett: Yup. Not all this people convert. And so they visit your site, maybe they’ll love your Facebook ad, they don’t but now or later. So one or two weeks later they thinking, “What was that company? I get go back and visit that.” Or if they’re like me, like, “Let me go ask my wife so I can find this, but so now I’m going back to look.” And so now where am I gonna go? I’m gonna go Google. I’m gonna go Google. I’m gonna search for that brand with the name of the product. I’m gonna go check it out further, so that’s where search and shopping come into play. Or it could be somebody that they saw it, they like it, but they completely forgot about it. Now target them on Facebook, of course, but now I can target them on YouTube, right? That’s a whole another platform where I can begin to remarket to someone and reintroduce my offering through video and reach them. Ezra: One of the things the you set up…by the way, Bobby Knuckles [SP] just joined us, Rob Burns. Brett: Bobby Knuckles is that serious? Rob Burns? Ezra: Rob Burns, I call him Bobby Knuckles. Anyways he’s a owner of a videotelepathy.com it makes videos for your YouTube adds. Brett: Dude’s real. He’s a real deal. Ezra: He is the real deal. He is a good dude. But let show an actual example on this. Just to get you make it real practical, so pop up a face camera for a second because I wanna…actually, I wanna…before we [inaudible 00:15:30]. Boom by Cindy Joseph, my skin care brand, you guys are all familiar with it. We run a lot of our top line or awareness advertising on Facebook. So once people watch video from us on Facebook or they come to our website on Facebook, most those people leave and don’t buy. So what Brett setup for us is, this is a later stage in the funnel now. Let’s say someone made it to a shopping cart and abandon the cart. So, normally, we re-target them on Facebook. We say, “Hey, you made it to our shopping cart. Come back,” and they see that on Facebook. What Brett added in here is…we can go to the screen now, a YouTube add that says that when someone visited the cart within the last 15 days and didn’t make a purchase, show them this ad. So we look at a preview of this ad, what you can see is not only is it a reminder ad to buy our, about who we are why they should come back, but it’s overlaying our products. So, if we actually look at it live on YouTube here, let’s go back to the…there it is. What you can see is that, someone would see this ad. You can see its had 800,000 views so a lot of people have seen it. It’s got a link to our product right here… a link to our store right at the bottom. It’s got our actual products in a carousel up at the top here, and if you would actually play this, I believe at some point, you get a call to action overlay here at the top to the shop. Brett: Yeah, get those products overlay on video right there. Ezra: Look at that and they overlay. As your consuming this video, you can actually see the products that were in your shopping cart when you abandon. Let’s go back to face camera for a second. So just talking about the power of cross-channel remarketing. So someone came in on Facebook, they made it all the way to the shopping cart, but they left, now if they go to Facebook they still see a Facebook ad, but if they end up on YouTube, they’ll see a YouTube ad. Brett: Yup, and appears a lot of time on YouTube. And then cool about YouTube ads, and this is a slight difference between YouTube and Facebook, and both are powerful when you use both, but with Facebook what it is? Is it 3 seconds before it cancels a view you got to watch 3 seconds of a video with YouTube it’s either 30 seconds or the whole video whichever comes first and your only paying if they engage that long. So if someone skips your add after 10 seconds or 25 seconds you don’t pay anything for that impression. Now if they click on the PLA you’re also charged for a view of that point. Ezra: A click, yeah. And if we just look at like the last 30 days of this particular, you know, bought for example. This one is visited the cart but didn’t make a purchase. Brett: The past 30 days. Brett: YouTube conversion is right. Brett: Fifteen days is even cheaper like 5 bucks or 6. Ezra: Look at that, $5 a sale, $6 or $7. This is much cheaper retargeting sales than Facebook and it’s people that we wouldn’t have captured on Facebook. So it’s adding an additional source of reminding people that you exist by leveraging YouTube ads which is super cool. Brett: Absolutely. We also got the bot x but not y. This is super fun. Ezra: That’s a whole other level of…that is a level of sophistication. So I guess we can talk about it since you brought it up. Ezra: No, I think we got to talk about it now. So one of the things that we do with our brand is if you buy one product, we run ads to remind you about who we are and say, “Hey, because you bought this thing, you might enjoy this other thing.” And so we do that on Facebook. But Brett’s been running that for us on YouTube and…I mean, boy, look at that. These are working really well. Have been actually here looking at this in a while. Brett: So someone who has purchased but does not purchased Silk run, Silk ad, and the Silk PLS, right there. So we handpicked the silk products to run next to it. Brett: “Check it out,” yeah. Ezra: And here’s why this product is beneficial to you and those are working extremely well. Yeah, that’s kind of cool. I didn’t know about…but yeah, that’s setup and going. So I’m looking at the questions here, and I’m gonna go ahead and just take a look. If you have questions for Brett the Fury Curry. Brett: Bring it on. Bring it on, we’re ready, man. Ezra: He’s got a real solid. He’s got a shimmy. Brett: We can dance a little bit. We can make it happen. Brett: Freestyle, man. I just making up as I go. Ezra: You are like cat pop. You’re just the cat pop. Ezra: Someone commented on here in all caps. It says, “You all had some espresso today.” All capital letters. Brett: We did. We did. It was so good, man. It was so good. Ezra: We must have hiked up out of our lines. Yeah, that’s hilarious. All right, let’s take a look. Okay, “Hey, Ezra. I run a small… This is Juvich Weld [SP]. Juvich… I run a small raw organic chocolate company. Can I team up with you as an affiliate for your brands?” [inaudible 00:21:12] about YouTube but I will skip that one. Brett: I do like chocolate. Brett: Yeah, you can. So, I mean the beauty of Google, whether it’s search or shopping or YouTube, you’re only gonna pay when someone engages with your ads. When someone clicks on your ad for searcher shopping. When someone watches your YouTube video or if they click you’ll pay for that too. The thing that you have to think about though with remarketing audiences is they do have to be a certain size before you can actually target them. So, typically, they need to be over a thousand people you can target them. Now, it doesn’t hurt to go in and set things up because if you’re doing other things right. If you’re running Facebook correctly, you’re crushing on Amazon, the volume will come. You’ll get people to your site. Ezra: I mean look, no matter how big your audiences are, you should set all this up. Ezra: As it grows, it’s just gonna be essentially. It’s gonna be more predominant. Brett: You’re not gonna be spending much in the beginning, but it’s gonna grow, it’s gonna build, it’s gonna convert, and convert really well. Ezra: We had a couple of people say, “Where can we get the guide and course to setting this up?” Brett Curry and I are producing a training program on how we use YouTube ads, Google ads, Google search, re-marketing. How we’ve leveraged Google to grow my e-commerce brand. We’re gonna document it. If you’re interested in that training, this is not meant to be a sales video. This is just us talking about what’s working for us so you can be inspired and use some of it in your business. However, if you’re interested in that training you can send me a private Facebook message saying, “Hey, I want the training,” and then we’ll give you a discount because it’s not come up for a few months. So you have to PM me it’s not even out yet. Okay, so here’s what we’ve got. Dominic says…this is very specific question for you, “We have a video, a helpful video running on YouTube. We’re getting 300 videos per day, people watching 90% of it. The majority are coming from suggested video views on YouTube. What would you do next to start engaging that audience? Target them with a YouTube video or cross-promote a YouTube on video. How do you engage someone’s consuming content? Brett: Good, good, good. Okay, kay. A couple of things. So now, you can take a list of people that have watched that specific video. You can build a re-marketing list of just those people. You can then layer that into…I would layer into search and shopping, okay? So Google Shopping, the PLAs. So you got these running for your products. You can set up a campaign and just target those people. So say, you’re not ready to go higher in the funnel and reach people. Let’s say you just wanna reach those people because you know that. Hey, they watched the video, they probably somewhat interested. Now, if they’re searching for my product, or my category even, I want them to see my Google Shopping ad, it’s the same thing with search. We can target just those people in search. Ezra: Right. So all of those folks who are consuming that video, you can re-market on a channel. Brett: Yeah, put them on a list. You could also then say, “Okay, now…” So maybe that’s just an educational video, “Now, I wanna create a video that sells.” Demonstration is a strong call to action. We got a companion banner on that video or maybe the PLAs next to the video. “Now, I’m gonna run that video ad and just target those people that have seen the other videos.” So you can re-market on YouTube as well. Brett: Be wherever your customers are, if it make sense. They’re on search, they’re on YouTube guaranteed. Ezra: Question is, are you able to target people on YouTube with uploaded audiences like on Facebook or do you only have pixel re-marketing? Brett: You totally do upload audiences. A few things you can do like you take what’s called the cost rematch list. So that’s a list of people that are on your email list so they’re either customers or whether you get powered up. Ezra: We have a guy here’s like crawling behind the scenes. He’s literally on the floor as we speak. Brett: Way to go buddy. Brett: Nobody saw that at all. Ezra: I saw him for a second. He almost made it. Brett: That was phenomenal. So you can take your email list, could be buyers, could just be newsletters, subscribers, whatever. You upload those to Google. They’re gonna do it’s called cost rematch. Try to match that list to known users that have a Gmail account. Then you can target them. You could also build that list to create a similar audience which is like a lookalike audience in Facebook. So Google’s gonna say hey based on these people you uploaded, here’s another group of people that behave the same way. Ezra: Doing the same stuff you can on Facebook. Ezra: Interface isn’t quite as let’s say robust but rather it’s more robust but it’s not quite as user-friendly. Now, I wanna talk about one other type of campaign that you set up for us that like in the last month, well just zoom in these stats here for a second. Brett: This is pretty crazy. Ezra: The last month we spent $1.31 to generate 2,000 per conversion. We spent $2,500 to generate 2,000 sales. So why does this work so well? What is the strategy actually? Brett: Yeah, so this is someone looking for Boom by Cindy Joseph. So we’ve got pretty specific keywords. So these are people that have seen your Facebook ad. They’ve the video something so now they’re saying, “Yeah, I wanna buy a Boom product,” right? So they’re digging in and looking for Boom by Cindy Joseph. And so it’s gonna convert really, really well because they’re looking for you. But, we wanna run these ads because we don’t want a competitor to come in and take that position. We don’t necessarily want them to buy from another channel. We want them to buy from you, directly from Boom if possible. And so there is a couple of others, I assume. Ezra: So basically, we are talking about…sorry to interrupt you. Ezra: We’re talking about when a user searches for your brand on Google or Google Shopping showing up in an ad placement. You were telling me I need to do this and I was like, “Dude, when someone searches for my brand, they just click on the organic listing,” and you were like, “I will bet you there are people running ads on your brand name,” and you were right. People are running ads on my brand name. Brett: And you being there is kind of a defensive mechanism tool to keep other people potentially from doing it. There was a competing skin care line and saw that you weren’t bidding on your name, their prime opportunity for them to jump in. We’re also running shopping ads as they’re not showing up probably because you got your IP blocked, but we were running shopping ads too from you. There you go. Ezra: What I will say about that is like, you know, your brand may not very big so you don’t like you may think nobody’s searching my brand. But even if you have a small brand, and there’s not a lot of search for it, you put a real small budget. Saddle up, put a real small budget, and then as your brand grows add to that budget so you’re showing up in your in that spot. Brett: Only if you have someone clicks. Another side benefit and some a lot of people don’t realize is that it can help your overall AdWords account. And so Google loves click to rate, high click to rate, meaning the percentage of people that see your ad, click on your ad. And so this brand campaigns have click to reset or off to chart. By giving Google that’s signal where they say, “Man, look how quality this ads are, people love this ads,” it can help your whole AdWords account. There’s also a benefit in just boosting your other campaigns as well. Ezra: Because it gives you that positive history, you’re like this thing work so well. Brett: Yeah, Google like this is as quality it can. Ezra: This people must begin with something right? Ezra: By the way Greg… Do you know Greg Merelis? Ezra: The Australian designer guy. Brett: Oh, maybe I do know him. Ezra: You know, might Greg Merelis, yeah. I’m pretty good Australian accent. Ezra: He’s a good dude. He just join us on the call. I see Adam, “the mouth tease falcon,” Maltais. Brett: Adam, what’s up brother? Ezra: Thrown the double, you got the double from Brett Cury that’s no joke. Greg Merelis he’s used to be our…he’s a great designer. He runs Studio One. Brett: I think met him in one of [inaudible 00:29:36]. Ezra: You met him in one of my bands. Brett: Yeah, yeah. Sharp dude. Ezra: He’s laughing, but he knows that my Australian accent is on point mate. Brett: Another shrimp on the bob. Ezra: Throw another shrimp on the bobby. All right, well, I feel like we kind of covered… Do you have an Australian accent? Brett: I was trying to do it right there. Brett: It’s a beautiful, beautiful crow look at, I don’t know. Ezra: That was pretty good saver when actually. So I feel like we kind of really just touch down the main points of why leveraging Google as a sort of visibility source for your brand might make sense and kind of how you’re using it, talking about this course that we’re going to do that’s coming up a week, kind of break down what’s going on with boom and just sort of introducing this idea. Greg Merelis says your accent is terrible. Brett: Yeah, we were talking about you or me. Ezra: We were talking about you. Brett: I know it’s bad, it’s bad. I’m sorry Greg. Ezra: Greg you offended the one Australian in our audience. Brett: Foster Australian for beer. Terrible too. I got to stop now. Ezra: Talking about why we should use Google, the benefits of Google. I guess we’ll just wait see for if any other question coming else, any else you want to just quickly say? Brett: I mean, one thing I talk about so get to hang out of the Google headquarters you talked about that earlier, last couple days for Google premiere partner event and then Google partner summit and there’s something are revealed that I can’t go to details because of an NDA, but they were talking about audience targeting and that sounded way cooler maybe than it actually was. Brett: Mightmatch what’s up brother. And so Google’s going to make it easier and easier to really look at who are targeting. So going beyond the keyword and going beyond just like a generic remarketing list, but really looking at who this person is. I’m totally excited about some of the new audience capabilities that are going to be coming up very soon. We’ll talk about it in the course. We’ll talk about it in future videos, but it going to be pretty cool. Ezra: They wanna compete with my brand Zipify because they feel like we’re real threat. Brett: They’re talking about Ezra of Firestone. They talking about Ezra, what is Ezra of Firestone running. You know it so true though, I’ve been in meetings where Google people are talking about, we see what people are doing with Facebook. Ezra: That what I meant to say. Brett: We want to make sure that those capabilities are there with Youtube, with GDN, and the other properties on Google and so. Ezra: That was I meant to say, they want to compete with Facebook and they want to make their ads product because they have…like if Facebook ends up beating Google in the AdSpace it will be like when Facebook beat Myspace. Like Facebook should have never beat Myspace. Google has such a large head start. 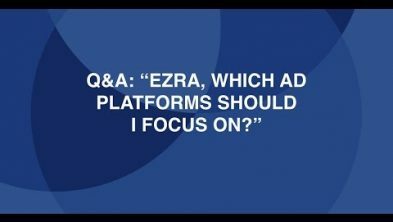 Ezra: They should never, they should not lose to Facebook in the ad space. So they don’t to lose and the reason that I Zipify instead of Facebook because I got a text message from my Tech guy here, Tech supervisor who was like, “Hey, by the way, remember that this presentation is brought to you by Zipify app,” which is, we sponsor Brett Curry podcast which is the. Ezra: And we’re going to play a little video about our flagship product Zipify pages and then we’ll move back to close up. Announcer: Looking for a quick and easy way to create high converting landing pages and sales funnels for your Shopify store. Well, first want is a landing page? Well, it’s any specific page that you send traffic to, to prompt a specific result. Let’s say a newsletter sign up, or a holiday sale page, or any goal that you might have. And if you create a series of pages that share a common goal, let say a landing page, a sale page, and post checkout thank you page, then you have a sale funnel. Landing pages are perfect for growing your business by boosting leads and sales, but right now there’s a big problem. To create a landing page for your store, you can either hire a designer and a developer to create one for you and that takes time and money, or you can use a landing page builder, which is faster and less expensive. But the problem is, none of the landing page builders on the market integrate with your Shopify store. So you have to deal with confusing plugins and subdomains, and skewed analytics which is extra cost, and extra hassle. Well, now, there’s a solution, introducing Zipify pages. Zipify pages is as eCommerce landing page and sales funnel builder that’s seamlessly integrate with your Shopify store. start by choosing a template from our ever-growing template library. This page template come directly from our eight-figure e-commerce stores that are built on Shopify. We test what works and we put our best templates in the Zipify pages. After selecting a template, it’s easy to customize it to fit your store by using our drag and drop editor. You can choose from our collection of conversion elements or blocks as we like to call them like featured products, countdown timers, social prove sections, and more. Once you off to page, just the way you like it, click “Publish.” It’s as easy as that, you now have an amazing new page published right to your Shopify store. Your page will look great on any device. It’s a 100% mobile responsive and all of the data is under one domain. So tracking leads, and sales and Facebook is easy, simple, and accurate. High-quality landing pages, and sales funnels as soon as you need them. Zipify pages, check it out today. Ezra: Are we back? We’re live. Ezra: Some of us saying…someone was like making fun of us in the comments. First of all, making fun of my rings which I really love. I will not stop wearing my rings. I like them. Yeah. Hey, man, everyone got their style. Brett: Absolutely, I like it. Brett: A little bit silly. Ezra: …you’re not a fit for this community and if that is what is important to you, then, you know, hey listen, I’ll catch you down the road. And the other person was saying, you can’t produce shows like this without getting some haters, it happens. Brett: Which is fun, yeah. Brett: If you’re going to make fun of your Australian accent which in this case is totally warranted. Ezra: We pissed off another Australian actually. Brett: Oh, dude, I’m sorry man. Brett: That’s what I’ve heard. We got a good friend, our good mutual friend Mike Rodes from Australia, hates fosters. It just what came to mind. I apologize to all the Australians. Ezra: The other guy…oh, this guy who said I should lose the rings actually is backtracking on that. Well, thank you. I appreciate that. He says he was giving me a hard time, it happens. You do not have to leave out community. Please, stick around. Actually, everyone is welcome even if you wanna make fun of me, you’re welcome. The other thing that I will say is someone was claiming in the comments making assertions that this was not live. That we are not live right now. Brett: How can we prove this to you? It is so live right now. Brett: It’s the livest it could be. I’ve never seen any more live. Ezra: I challenge you to challenge us to do something in the comments right this moment we’ll do it. Brett: Look at the date on my watch. Ezra: Yeah, look at the date on his watch. So what are you gonna…how can we prove this. Brett: Yeah, prove it, let’s do it. Let see right now. It’s going to be fun. Ezra: Give us something to do here. Brett: We are so live. Ezra: This is a, let see three seconds is this coming in a replay? No this is not a replay. I did see your Boom out on YouTube. It is live, okay nobody is giving us, a time call? Yeah, what time is it? It’s 4:53 p.m.
Ezra: Eastern time. That’s a good idea, time call. Brett: On Friday [inaudible 00:37:04]. Ezra: Do grey squirrel, rub your tummy and pat your head. What is a grey squirrel? “Dance on that table,” no. I’m not gonna do that. Brett: Dude, I’ll break the table? Ezra: Play the guitar, play patty cake. You know how to play patty cake? We got to go one left, left…daughters, man. Brett: They’re six girls. I should have be the suit. Brett: How do you know this still well? Ezra: As fast as you can, double. Ezra: Double, you got to go two doubles, two doubles. Brett: Oh boy, that was weird. Brett: I have lots of kids. Ezra: You don’t play patty cake with your daughters? Brett: I have never play patty. Look at this, look at this, this is silly. Brett: Okay restaurant in spring field, I’m going to go with the Black Sheep. It is a burger restaurant. They have the best burger in on the planet, the blues brothers. Its got this, caramelize bacon, it’s got this mayonnaise. Ezra: Caramelize bacon, sound pretty. All right, listen I think we’re done for today. This is been a really fun show. Thank you for showing up and hanging out with us live on this marketing fan page. And as far as on the fan page. A lot of people are asking me to dance because I showed my dance move at contents e-commerce. Brett: You got moves, man. You’ve got move. Ezra: I got a little bit. I mean, I’ve been getting there. It’s been coming. So Brett, always a pleasure, man, I really forward to doing this YouTube course. You know, talking about how we’re using Google and you know, you part of my community on my list you’re be seeing that coming out. Ezra: So thanks so much Brett. Where do people find you? Brett: omgcommerce.com that’s our agency site also ecommerceevolution.com, check out the podcast couple of great episodes with the man, the myth, the legend, and some other really good stuff too, like Molly Pitman and Mike Rhodes, and some phenomenal people so check that out. Ezra: This show is also brought to you by OnecClickUpSell which is an application of my app company, Zipify apps that allows you, if you’re on a Shopify store to make more money from any order that you have on you have on your store. In fact, we are now powering over 2000 stores. We process about $80 million in orders through the app. On average we’re making store owners about 15% more revenue per order from day one and I think we have a video that we can play for you, give me a thumbs up, yeah. So we’re gonna play a little bit of video, a little-animated video about OneClickUpSell and how can I help your business and we’ll end the show. So thanks so much for watching. Catch you on the next one. Announcer: What if I told you that you can increase your average order value overnight and your overall revenue just by adding one-click post-purchase upsells. You might say, “Great, what’s an upsell?” An upsell is when you offer your customer a product that is complementary to what they already shown interest in. It’s when you order a hamburger and some asks, “Would you like fries with that?” Or you go to the Apple Store, you buy a computer and they offer you Apple Care. Offering up sales is the easiest thing you can do right now to start growing your business because by increasing your average order value or the average amount of money you make per order, you’re getting value out of the customers that you already have. Unfortunately, upselling does pose a big problem. Making more offers to your customers adds friction and slows down the buying process. In the world of short attention spans and abandoned carts, this is a huge concern. The last thing that you wanna do is scare off customers and end up losing sales. What you need is a way to offer upsells but without any of the risk and that’s why we created OneClickUpsell. With one OneClickUpsell, you can offer one-click upsell, postpurchase. Due to new updates, the Shopify platform, we can now give you the ability to make targeted upsell offers to your customers after they purchase and after you secure the sale. So, once the order is complete, instead of going to a thank you page, your customers are directed to a post-purchase OneClickUpsell offer page. Where you can offer complementary products and special deals without adding any friction to the buying process, and without the risk of losing your initial sale. None of the risk, and all of the reward. It’s called “having your cake and eating it too.” And with our page editor, it’s easy to make professional upsell offer pages and customize them to match your store. We have a tagging system that lets you customize which upsells you offer depending on what your customer has purchased in the initial order. And an in-app analytics suite tells you which upsells are most effective so that you can optimize for higher conversions. Your revenue can skyrocket overnight, and there’s a bonus. OneClickUpsell comes with a bonus post-purchase email sequence. This is a series of emails that will allow you to keep your customers engaged after they make a purchase which will decrease refunds while increasing reviews, customer loyalty, and most importantly, repeat purchases. It’s another great way to make more revenue from the customers that you already have. So let’s review, with OneClickUpsell you’re now offering one click, post-purchase upsells that make you more money from every order. And you’re sending automated post-purchase emails that generate more sales from every customer. Sounds like things are on the up and up. So don’t wait, try OneClickUpsell. Shopify’s only one click post-purchase upsell tool. Ezra: So it’s kinda like…like, basically, I got it from my phone and I’m watching it here but what happens is the phone displays all the comments like way faster in the desktop. So you can’t actually judge, like, what the response is and what people are saying. Brett: Unless you got the phone. Ezra: Unless you have the phone live. You need the phone live and then you’re logged in to your fan page in order to be able to see all that. That’s a pretty good one. Hey, man. How are your kids doing? Brett: My kids are good actually. So I have eight children, true story. Six daughters. Ezra: A lot of kids. Brett: I’ve got a lot of kids. It’s chaos in my house. Ezra: You’re [inaudible 00:43:07] but then I don’t know. Can we share this? Brett: Sure. I think so, yeah. Ezra: Like six years of total pregnancy. Brett: Yeah, my kids are great. Full of energy, full of life. Just their craziness themselves. Ezra: Good for you, man. It’s a lot of work. Brett: It’s a lot of work. Brett: It’s kudos to my wife, man. She rocks, she is a superstar. Ezra: You two as parents for certain… Anything else you wanna talk about. I know we ended the show and now we’re just back online. Brett: I was kind of chilling. We’re just kinda rumbling. Ezra: We do have a brisket in the oven. Brett: Brisket in the oven? Yeah, you introduced me to a local meat shop which is fantastic. Ezra: I know need a rabbit, I got your rabbit. Chris [inaudible 00:44:13] meat shop. Stock up and beacon all day. They’re great. I love those people and, especially love their business food. That’s good. I get rotisserie chickens from there. Ezra: Anything else we want to chat about? Brett: I think we’re good man. Brett: Yeah, I met Caroline [inaudible 00:44:34] commerce. Ezra: She wants to know if we enjoyed content in commerce. Brett: We did enjoy content in commerce. Brett: Got to hang out with some awesome people. I love the digital marketing community. Get to hang out with Molly Pittman. Ezra: Should we do a shout out to Molly Pittman real quick? Brett: Yeah. Molly, you’re great, yeah. Brett: …you’re the real deal. Ezra: Maybe we’re done with the show. Brett: This feels done. This good to me. Ezra: Okay. We are actually over and out this time. Catch you all later.